SEO agencies and SEO professionals love our agency packages. 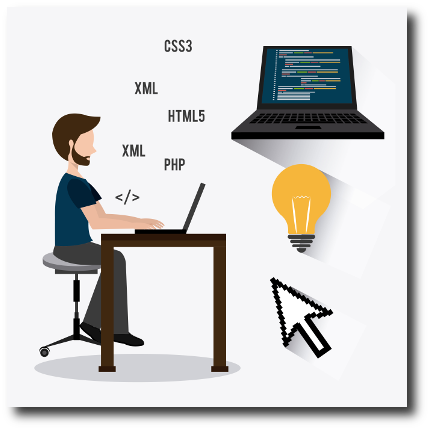 Agency packages allow you to track multiple websites conveniently. Each website automatically has its' own login, and the master account has a single login to all of domains. Each single website login allows only to view the website's data, while the master account can also modify/cancel them. The master account has a special overview screen for easy overview of the overall status of the accounts. We got 2 levels of white labeling. Logo branding - this feature comes with each agency package, and allows to replace the top logo on both the online interface and the downloaded reports. Full white label - this feature, allows to brand the entire online interface (as seen in the left image), the reports, the email address used to send mails to the client, and your URLs. 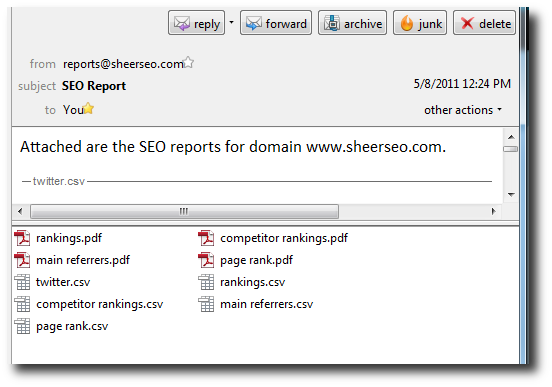 It erases any mention of sheerseo.com from the application. Reports are collected and can be sent automatically to each of the websites in the account. We can send the report to the client, or just send a notification that new data is ready, or neither. 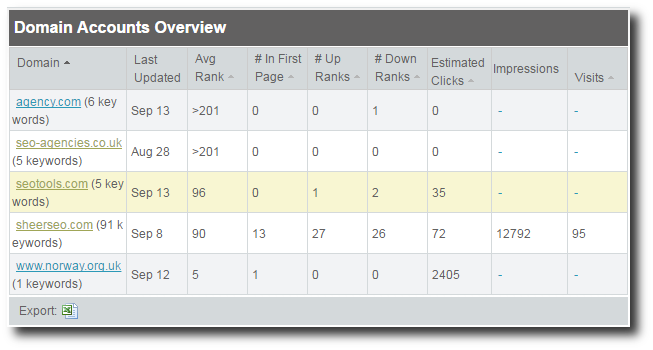 Reports can be for keywords, backlinks, or social data. If you want to embed our data in your application, we got an XML API for our rankings data. This service has extra costs.